Jat agitation ends today after assurance from Haryana chief minister(CM) Bhupinder Singh Hooda. Khap (Jat caste council) leaders and All-India Jat Aarakshan Sangarsh Samiti(AIJASS), which is spearheading the stir, jointly announced "suspension" of the agitation till 13th September 2012. "Since Chief Minister Bhupinder Singh Hooda has given assurance to Sarv-Khap leaders regarding the community's OBC status demand, we have decided to suspend the stir," Mahendar Singh Punia, State General Secretary of the Samiti, told reporters. Meanwhile, the government said it will try your decision on the issue brought to book as soon as possible to the center. The agitators of all committee members and leaders agreed on the withdrawal of said movement. The agitators softening in his stance, showing the bodies of Sandeep's funeral made. Now all roads including Hisar-Delhi National Highway is open. 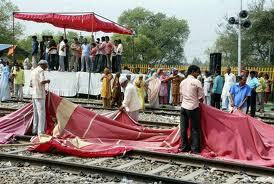 Railway tracks were also cleared by the protesters. In the next six months, Haryana's Backward Classes Commission is expected to submit its report to the state government, which is why the Jats have given the government September 13 as the deadline, a Jat leader said. AIJASS stands for All India Jat Arakshan Sangharsh Samiti, which is organization of Jat Community, fighting for OBC reservation in Central Govt. of India. AIKSS is maily situated in Haryana, Delhi and northern India. AIKSS of Jat community has been holding protests from long time demanding reservation in government jobs and educational institutions under the Other Backward Class (OBC) category. Jat agitation in Hisar took a violent turn today as protesters torched a police post and a judge’s car. The Haryana government today sought the Army’s help in controlling the situation. The district administration has announced closure of schools for three days. Markets, hotels and fuel stations remained closed throughout the day. A curfew is likely to be imposed in Hisar and neighbouring areas. While the protesters have paralysed rail traffic for almost three weeks now, demanding OBC quota in government jobs and educational institutes, tension erupted following the alleged death of a youth, Sandeep, 20, in police firing on Wednesday. Five others are reported to have suffered bullet injuries. Thousands hit the streets in Hisar on Wednesday morning, and the mob grew increasingly violent. There were reports of protests in Jind and Bhiwani too. Barely 100 metres from the military station, Hisar, the mob torched the Hisar cantonment police post and also looted an SBI ATM. Another SBI branch was vandalised. Hisar Deputy Commissioner Amit Agarwal said the state had asked the Centre to deploy the Army. The official vehicle of Sessions Judge, Jind, Raminder Jain, was set on fire near Hisar late last night. His gunman and driver were held hostage by the mob, and were only released in the early hours today, after the intervention of the tehsildar and district administration. The protesters brought Sandeep’s body to the blocked rail track and refused to perform the final rites till all the Jat leaders were released immediately.